Presented by Mrs Alethea Pitt, 1984. The appliqué medallion, with its pearl border, was part of a large pot, of which there is an intact example in the Museum für Indische Kunst, West Berlin, similarly decorated with round medallions surrounded by a pearl band, but where the motifs in its medallions are of Indian or classical inspiration, as are the appliqué lion masks of [EAX.68], the bearded figure in the Museum’s example show stylistic affinities to art further east. In particular, the hooked eyebrows are reminiscent of the famous wall painting of Mahākāśyapa from Kyzil. 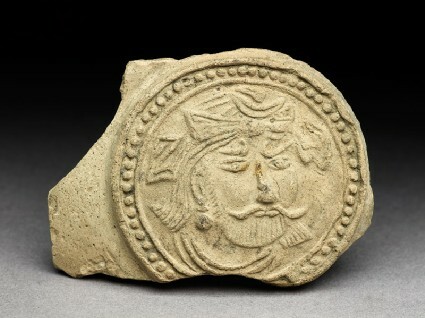 This and several other small terracottas from Khotan were acquired by Sir Armine Dew in the North West Frontier Province in the 1920s.